My deepest intention is to awaken, enlighten, and empower you, so it would be a great pleasure to share these messages with you. They are the gems that have inspired and motivated me, my clients and students over many years in the personal development field, some tales of my travels as “spiritual tourist extraordinaire” and news of my events. 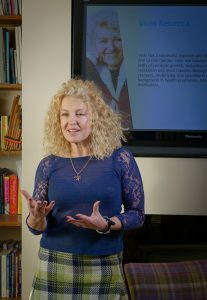 Alongside one to one therapy work Vicki teaches small groups the core skills of personal growth, including various means of relaxation and mind mastery through talks, classes and on retreats. Underlying that practice is an extensive background in health promotion, fitness training, yoga and meditation. Just what i needed today Vicki, thank you.